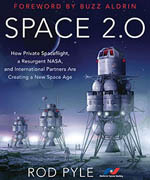 This book describes a grand vision—a string of largely self-sufficient settlements spread across the northern face of the Moon, interconnected via a network of roads and power cables, thus creating a thriving lunar civilization. It is based on Peter Kokh’s 31-year history of writings in the Moon Miners’ Manifesto newsletter which were compiled into major topics by the Moon Society. NSS members will find a book rich in details about building this new community on our nearby satellite, with information about infrastructure, commerce, and daily life. 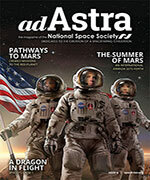 It matches well with our society’s Roadmap to Space Settlement and our vision of humanity living and working in space. The author proposes locating the settlements across Mare Frigoris (the “Sea of Cold”), which is near the top of the Moon when viewed from Earth, and the reasons are many. First, there are a number of large, nearby craters that can easily be driven into for ice harvesting. Second, basalt (essentially cooled lava) is widely available for creating buildings and radiation shielding, as well as making furniture and even cloth. Third, many chemical deposits can be found there for industrial use, as an included map of the locale indicates. Fourth, the author states that, by spreading the settlements across 180 degrees, and connecting them via superconducting cables, the entire colony would have some solar power even during the 2-week night phase. Interestingly, the book states that positioning our first outpost instead at one of the Moon’s poles, which is widely considered a first step to establishing a permanent presence, could be a dead end which never expands into a settlement. Although ice is available there, accessing it from deep, dark depths lined with very steep cliffs could be treacherous. Basalt is also not easily found at the poles, making it difficult to expand the outpost. And finally, by having sunshine available most of the time, humanity would not learn how to thrive where the days and nights last over two weeks. After describing how each settlement might be built, with detailed drawings and explanations of the materials used, Mr. Kokh spends many chapters describing daily life in such a civilization. Residents would select plants for suitability and include them in “living walls” that line the corridors to save space. Citizens would shift gears from power-hungry industrial tasks during the two-week “dayspan” to labor-intensive work such as maintenance during the two-week “nightspan.” The author even suggests that a special meal might be made to celebrate the end of night, and he includes a calendar with new names for the “days” and “weeks” of the lunar month. There is a chapter on the settlers’ mental health, with suggestions for building skylights, creating sports activities both inside large hangars as well as out on the surface, and holidays that call for celebration. Details in the book even list the colors widely available from local chemicals, which would imbue light bulbs, furniture and clothing. The editors must have faced a herculean task in assembling and then culling duplicate material from over 30 years of Mr. Kokh’s writings, and the pre-print version I read topped 1,000 pages. The only negative impression I had of this version was that concepts were duplicated in various chapters, sometimes with a whole paragraph copied into multiple sub-topics. I provided that feedback, and now note that the final print version is three-quarters the original length. Given its length and format, where the 26 chapters are largely independent, I suggest the book is best read by skipping to a reader’s interest areas. The details inside can be fascinating and sometimes surprising. I learned there are companies that currently create objects from basalt such as pipes, tiles, bowls, cloth and sculptures. Also, the author suggests that fuel for generators, vehicles and rockets can be created from SiH4, a silicon analog of carbon-based methane. Although I must say I’m still scratching my head whether tourists will exchange their clothing for local homespun before returning to Earth. NSS members will find this book rife with detailed explanations of the many considerations for building a thriving and working settlement away from Earth. There is even a section about the changes needed to modify a Mars analog research station into a Moon version. Towards the end of the book, the passage that most resonated with me was “that the space enthusiast community has all too often attempted to sell the ladder of our dream one rung at a time. And when we do that, the rung gets designed as a be-all and end-all in itself…not as a part of the ladder.” Readers of this book should come away with a better vision of one form of that ladder. It is also available in ebook formats from both Amazon and Barnes and Noble. Thank you for reviewing positively Peter’s book. He is already hard at work on the 2nd volume in the series and we hope to get it out as soon as we can. Yes, it was definately a herculean task to prepare volume 1 for publication! !